This book, published in 1969, is a picture book classic. It tells the story of a greedy caterpillar searching for food. As the caterpillar nibbles its way through different foods, your child will not only enjoy the story but be introduced to the life cycle of a butterfly, the days of the week, practise their counting. Read the story aloud, taking time to look closely at the pictures when your child wants to and pointing out the little egg on the leaf, the fruits and the different foods the caterpillar ate on the Saturday page as you do. When you re read the book children might enjoy finishing the sentences eg ‘On Monday he ate…..’ they can pretend to be the caterpillar and poke a finger through the holes. Perhaps you could draw a face on a little finger to make this even more fun! Count the fruits together; pointing to them as you do. Children could tell the story to you in their own words using the pictures to guide them. You might find that children read the words to the same rhythm when they read as you do or use some of the phrases they remember from the book. 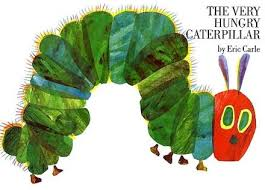 Listen to Eric Carle, the author read the story of the Very Hungry Caterpillar. At the shops look for different fruits, talk about them and buy some if you can. If you are lucky enough to be near a farm you could look at them growing or pick your own perhaps. 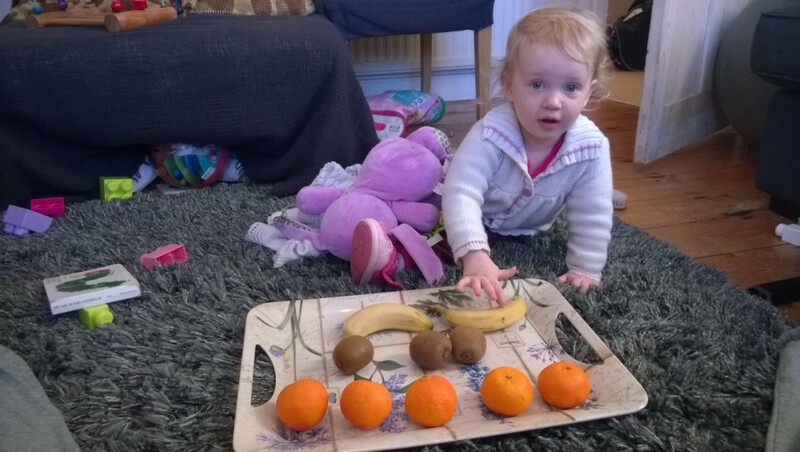 At home put some pieces of fruit in a row and count them together. How many bananas/apples do we have? Encourage children to taste different fruits, perhaps trying something they haven’t tasted before. Make playdough fruit Using playdough or plasticine create different fruits and foods together like the ones in the story. 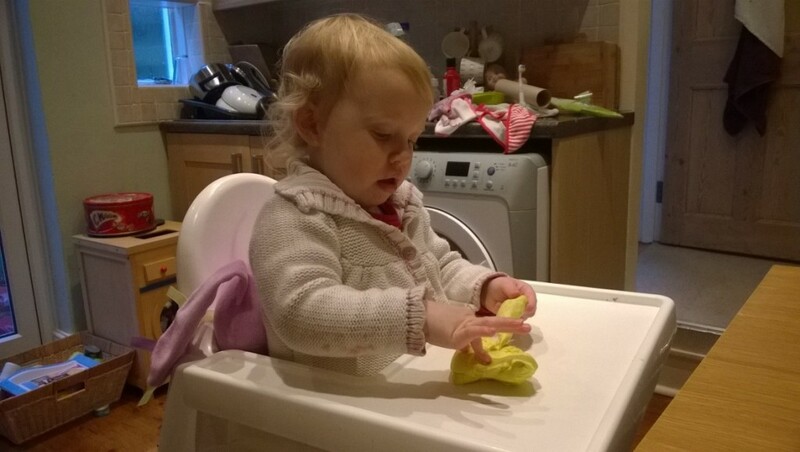 Talk about what you are doing with the playdough (rolling and squeezing) as you do. 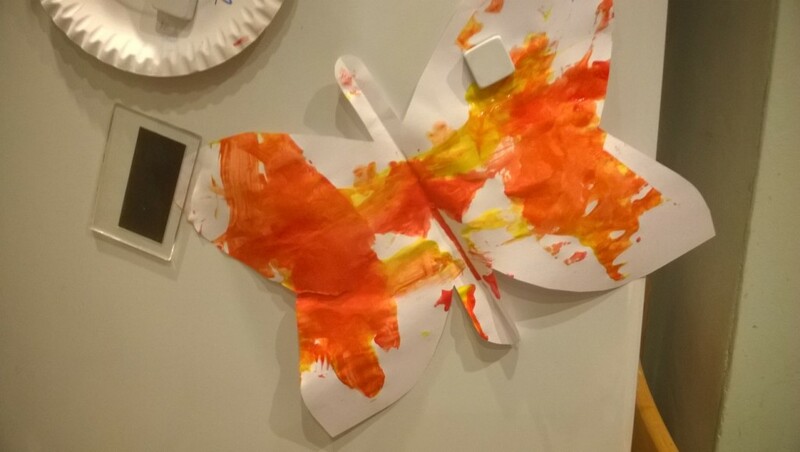 Make a butterfly picture You need paper and paint. Fold the paper in half and then open it out again. Your child can blob coloured paint along the fold line. Fold in half again and gently squeeze the paint between the paper towards the corners. Open out carefully to discover a beautiful colourful butterfly! Look out for butterflies when you are out and about and talk about their colours and how they move. Talk about healthy and unhealthy foods, what is best for caterpillars to eat – and what is healthy for humans too. Talk about the life cycle of a butterfly from the information you have found out. Children could draw the story of the butterfly’s life cycle on a large circle of paper divided into four sections. Cut out and collect pictures of butterflies and caterpillars from magazines and make a scrap book. Talk about the similarities and differences between them from the link above or information books. Children who are very interested in caterpillars and butterflies might enjoy visiting a butterfly house if you have one nearby or even growing a butterfly from eggs – kits available from some educational suppliers.